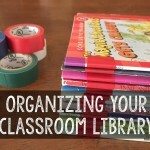 It is Throwback Thursday, and I thought it was a good time to share more about the clip chart system I use in my classroom. The last time I blogged about my clip chart was shortly after I started using it, and I can say it is still the most powerful management tool I have ever used. Mine is pretty simple. 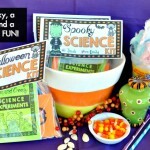 It has been re-posted a bunch of times, and is by far my most popular freebie. There are other, probably cuter ones out there, but mine is DIFFERENT. Others I have seen have the same concept… kids move up and down throughout the day as time progresses. Honestly, I have very few students who ever have to move clips down. Here is why I am still in love with this chart. Look closely at the language. The language is indicates a behavior and it is measurable. They learn about what being ready to learn means. They can tell me what showing pride is about. They know what it takes to be a role model. It is a very important and intentional piece of the chart. I will say, “Who is showing pride in our line today?” and magically… they all will be. 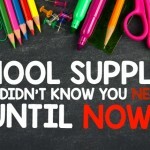 I will say, “thank you Brandon for being such a great role model by putting away your materials on time,” or “Kim is showing pride in herself by staying on task and working hard.” “Please tell me what you need to do to be ready to learn?” is also more positive than “You need to stop or you’ll have to move your clip down.” It has become part of my language. It is positive. 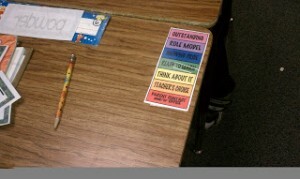 It is measurable and it is so much better then telling a student he had a good day. That means nothing to them. As with any beginning of the year, training is imperative. I am starting this year with some anchor charts to help the kiddos begin to understand the powerful language. I intend to laminate these and use them / pull them out all year long. I color coded them to match the colors on the chart. They are one of the new additions to my Companion Management Pack. If you have it already, please go download the update. Other than your assembled chart, you will need a supply of clothespins. I always start with plain colored, wooden clothespins. I write names on them with a Sharpie. of the year. I use Deco-Art’s Craft Twinkles paint in gold. At the end of the day, students record their behavior on their chart, and we pass out certificates. I send home the “Making Better Choices” with students on Orange or Red. Yellow is considered a warning in my classroom and students do not receive consequences for being on yellow. Outstanding students receive a sticker or a star drawn on their clip. I have tried both. It has been my experience that sometimes stickers are removed, so I have started using a colored Sharpie to mark the clips. After 5 more stars, they earn an ORANGE clip. WOWZERS! After 5 more trips to OUTSTANDING, they earn a GOLD GLITTER CLIP. This is the highest clip they can earn and become part of the “GOLD GLITTER Clip Club.” Even my very best kiddos do not get outstanding everyday, so two color clips and gold glitter will last me the year, but you can always add another color, if you want. 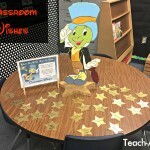 Gold Glitter Clip Club members earn a special lunch with me during the last week of school. This year we had Mickey Dees! 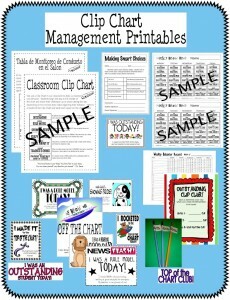 The forms and awards I use in my classroom to manage my clip chart system are available in my TPT store. I have included a weekly record to track behavior. I copy the sheets and keep them on a clipboard. Circle the student’s behavior for the day. To save time, I don’t track Ready to Learn, Showing Pride, or Role Model levels. 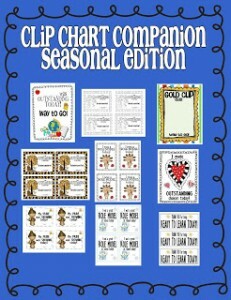 Look for my Clip Chart Companion- Seasonal Edition in my store. It has cute awards for every month and my GOLD GLITTER CLUB sign printable. This highly-rated pack thoroughly explains how clips are used in my room. It includes forms, awards, and parent communication in English and Spanish. 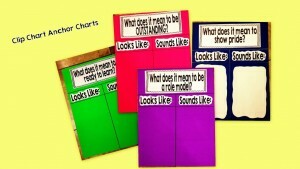 I have also added some more nifty awards and incentives, and the anchor chart printables. 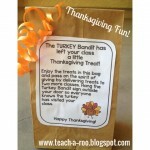 I also have a set of seasonal awards, too which my kiddos LOVE! And for my friends who need a little extra reminders, I use the mini clip charts attached to their desks with packing tape. They use a paper clip to move up and down. 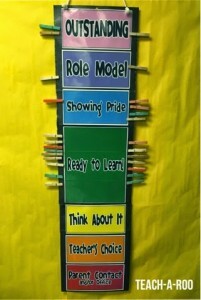 Love clip charts,,, have been using them for years! Cute rewards too. I’m teaching a 4th/5th grade class this year and am wondering if a visual chart like this would be appropriate at this age. I’ve used it successfully with 2nd & 3rd but am not sure it will be as well received with the older set.